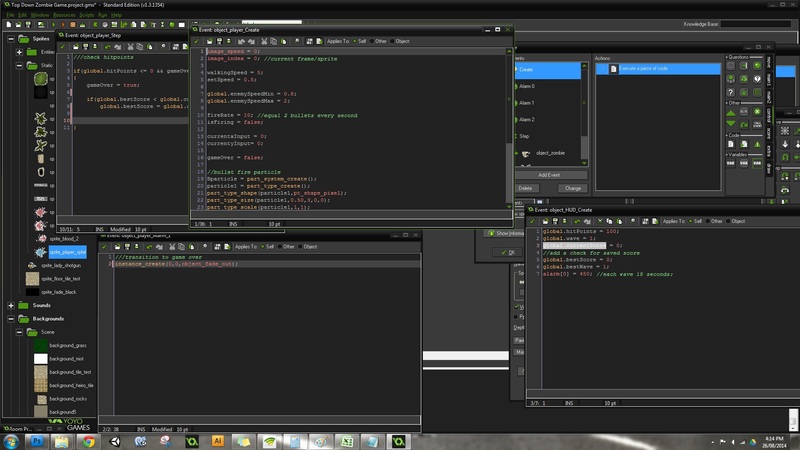 As I mentioned last month; coming from a lot of Unity experience, Gamemaker feels really weird. My biggest issue with the engine is that it feels really messy. This boils down to how the workspace divides everything into pop out windows. For example, every object is controlled separately from their own pop out window. Each of these objects are controlled by a series of events. In my case, each of these events uses a separate code block meaning that for each and every code block, for each and every event a new window is opened when I want to make changes. This leaves the screen cluttered and somewhat frustrating as they can be difficult to distinguish from one another. See the below screenshot for an idea of what I mean. It may well be a case of me working messily but in any case it has been rather annoying. I’ve put a request in to see if the support team can provide me any insight into my workflow woes. Still waiting on a response but if any of you Gamemaker users have any tips I’m all ears! Out of all this struggle I got a little disheartened. Devolution as it is now was created and completed in one month. I know I can’t expect to have the same speed with a new engine but it is quite the bummer to struggle to make progress. Rapid protoyping has become a major element of my creative process and I’m missing it. My attempted solution to slow progress has been to go right back to the drawing board and complete some tutorials. I chose this one, which has been a solid starting point for what has become this month’s game – Mummified. I could easily keep adding more (different enemies, more weapons, health packs, levelling etc.) but as I’m not planning on taking the game any further I’d rather move on and see what else I can learn. As I’m using just the base version of Studio I’ve only been able to create a downloadable Windows version. If you would like to play (you will need a controller) download it here. I’ve got another idea I will begin working on as a prototype next month which I hope will be my ‘test’ project for the engine. Basically if I can’t get this basic idea to work nicely in Gamemaker from start to finish I will have to consider abandoning the engine for any further Devolution development.